Pilates is now one of the most popular forms of exercise, with over 12 million people practicing worldwide. Here in the UK, its appeal has been ever growing since it was introduced from America by Alan Herdman in the 1970s. The technique was originally developed in the early 1900s by it’s namesake Joseph Pilates. Of course methods and techniques have been refined over the decades, but the basic principles remain the same. Pilates is a form of exercise designed to elongate, strengthen and revitalise the whole human body. Pilates concentrates on stretching and moving your body to increase balance, flexibility, core strength and muscle tone. The beauty of Pilates is that almost anyone can participate regardless of their fitness level or age. The benefits of Pilates are threefold. ‘I started doing Pilates with Melissa three years ago. My fitness level has never been better, and all the chronic aches and pains I had for years have disappeared. ‘Melissa has inspired me to take pilates to a more advanced level. She is able to accurately spot my areas of weakness and constructively advises how to correct them. 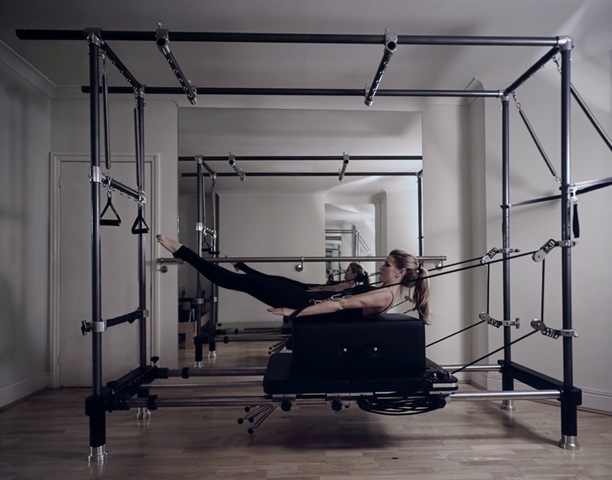 When I first came to work with Melissa Reinke, I had been doing Pilates for nearly 20 years in an assortment of studios in Los Angeles, San Francisco, New York and London and consider myself if not a devotee, at least with some knowledge of what a good studio can offer. Working with Melissa has been way above any other experience and the effects of our twice weekly work outs have been inspirational. I’ll add that I am a 75 year old woman who maintains an extremely physical 12 hour a day job that I am convinced I would not be able of doing without the work and pleasure put into my physical regime. Simply I think she’s the best. I have always suffered from tension headaches as a result of my shoulders being up around my ears worrying about something but from the day I started my 1-2-1 lessons with Melissa 3 years ago, I can’t remember the last headache I had! I now stand with a better posture, I’m more flexible and I’m much stronger. It’s a lovely satisfying part of my week that I hate to miss. She’s just the best and lovely too. Having tried a number of Pilates teachers over time, I am really pleased to have found Melissa. I have had a number of recent joint problems and operations and Melissa has been very skilled at working with and around these, ensuring I get maximum benefit from a session and work to my limits – but remain pain free. She’s also terrific company and I always look forward to my hour with her.